Skull of Yutyrannus hualiCourtesy Photo by Zang Hailong (via Nature)A huge one-and-a-half ton theropod discovered recently in China is further shaking up our old ideas of dinosaurs being oversized scaly lizards. The fossilized remains of Yutyrannus huali, a 130 million year-old tyrannosaur uncovered in the Liaoning fossil beds show evidence of a fuzzy coating of feathers on several areas, e.g. the tail, hip, foot, neck and arm. Yutyrannus huali is a distant relative of Tyrannosaurus rex(there is some contention about this) which didn’t evolve until much later in the Cretaceous period. Evidence of feathers has been found on smaller dinosaurs including the basal tyrannosauroid Dilong but these are the first clues that larger dinosaurs had feathers. Three nearly complete and well-articulated skeletons of Y. huali - an adult and two juveniles were found in the Lower Cretaceous Yixian Formation of Liaoning Province in northeast China. The adult is quite large, being nearly 30 feet in length and estimated to have weighed in life around 3000 pounds! The two juveniles weighed around 1200 pounds. All show evidence of having filamentous feather. Large animals today, such as elephants, rhinos, and hippos are somewhat hairless and tend not to need insulation for retaining heat because of their size and the ratio of surface area of skin to their masses. Whether Yutyrannus huali’s well-known descendent Tyrannosaurus rex had any plumage remains a mystery. T. rex was six times as massive as its ancestor, and arrived on the scene 60 million years later in the Late Cretaceous when the climate was warmer. But all it takes to change that is some new fossil to come to light. Generally, it’s thought that feathers first appeared as a means of insulation, species identification, or for attracting mates long before they evolved for use in flight. Today, birds are considered the descendents of small theropods dinosaurs called dromeosaurids. The discovery of Yutyrannus huali adds new clues and additional mystery to our conception of how dinosaurs appeared in life. 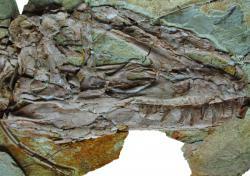 The new study by Chinese vertebrate paleontologist Xu Xing and his co-researchers appears in the science journal Nature.